Most menupwards of 70%would say that they have sensitive skin. But that doesnt mean their everyday shave has to be an uncomfortable experience. Presenting the Gillette Mach3 Sensitive men's power razor, the 3-bladed system razor specifically designed to deliver less irritation even on sensitive skin. This Mach3 innovation features a collection of technologies to improve the look and feel of just-shaved skin. This three-bladed razor has an enhanced Lubrastrip that adds a touch of aloe to deliver soothing moisture, while its front pivoting head navigates the contours of your face for a smooth shave. For those 70% of men out there, this is their simple solution for sensitive skin. •Enhanced Lubrastrip provides lubricating power with natural oils •3-Blade Technology with PowerGlide Blades for amazing closeness •Spring-mounted razor blades adjust to the pressure you apply while shaving •Protective Microfins help avoid nicks and cuts from the shave •Powered vibrations for great comfort •3 progressively aligned blades. For every stroke you take, it takes 3. Fewer strokes means less irritation •Lasts 2X longer than a disposable (vs. Gillette 2-bladed disposable razors, comparing average number of shaves reported by consumers in 2010-2011 national surveys) Product Description Most men—upwards of 70%—would say that they have sensitive skin. But that doesn’t mean their everyday shave has to be an uncomfortable experience. 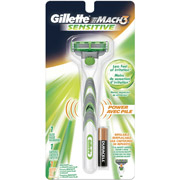 Introducing the Gillette MACH3 Sensitive Razor, the 3-bladed system razor specifically designed to deliver less irritation, even on sensitive skin. This MACH3 innovation features a collection of technologies to improve the look and feel of just-shaved skin. This 3-bladed razor has an enhanced Lubrastrip that adds a touch of aloe to deliver soothing moisture, and its front-pivoting head navigates the contours of your face for a smooth shave. For those 70% of men out there, this is your simple solution for sensitive skin.